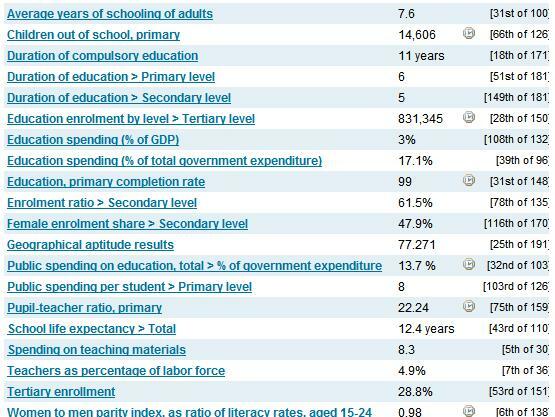 Perú statistics on education do not match those compiled internationally. The Pontifical University and San Marcus, both in Lima, have tied for first place, but there is a struggle between two in Lambayeque Province: Universidad César Vallejo (UCV) that outranks Universidad Nacional Pedro Ruiz Gallo (24 to 27) on international lists, while UNPRG (Universidad Nacional Pedro Ruiz Gallo) claims it is a better and more acclaimed school. UCV ranks in 2013 at 5792 in world universities.3 The National University of Pedro Ruiz Gallo (UNPRG) ranks on the world scale of universities for 2013 at 6460. Generally the private universities fared better than the national universities that were frequently the sport of game-players in Congress and vested interests, rather than guided by what is best for the students who attend them.4. For many wealthy owners of schools and universities, the goal of the institutions is to produce a profit or propel the owner into politics, rather than do what is best for Perú and the students enrolled. While these statistics are based on a composite picture of each university, the universities have also been ranked by department, specialties and other criteria. The least effective schools at nearly all Perú universities have, historically, been the School/Department of Education. What has dragged down Perú, regularly, is the perception of corruption: not just in politics, but especially in the field of education where students have an average of 2 to 5 points out of 20 points in all areas of academic study. Many times, especially in my own classes, the low grades are earned even when the student cheats using a cell phone to text for an answer. Many papers are the result of cut-and-paste by students so desperate for a passing grade that ethics are ignored and those who are able to obtain a grade fraudulently are applauded as being highly intelligent.5 At present, Perú is ranked 80 out of 182 studied, and the majority of Perú students find it difficult, to impossible, to enter any foreign university for initial studies or advanced education. Most find it imperative to study with a tutor to pass GMAT, or various other examinations required for admission. Education is not just classroom exposure and experience–it is a plethora of things ranging from gender ratio, library holdings, teacher preparation, teacher publication records, research, and student retention. Perú has the lowest rate of percentages of women to men in the area of literacy, school life expectancy, public spending per school, teachers as percentage of the workforce, etc.6 Civil and political liberties are weak 7 with corruption common in the Congress of the nation that has the worst record of funding education nationwide. Perú’s public and private spending on education has gone down every year from 20.7 (2008) to 19.2 (2009), 17.1 (2010), with a modest rise to 18.1 (2011). Perú is ranked 80th in the world for public corruption; that figure is less than one-half of that in the United States of America and represents fewer conflicts than among state legislators in Iowa, North and South Dakota, Texas and the southern tier of states where ethics is a slogan and seldom applied to stopping the push of state funds into legislators’ pockets.8. Perú, during the second presidency of Alan Garcia Perez (he had fled to Costa Rica during his first term in disgrace, resigned the presidency, then fled to France before returning to Peru to run a second time and win a second term), initiated the program “one laptop for every child” (Una Laptop por Niño program),12 statistics shows that the program did nothing to advance education in the nation.13 More time was spent playing online games or chatting on Facebook or other social sites, or viewing a variety of photographs, than doing any serious research or other scholarly pursuit by children in Lima, but few children had computer access in the mountains or jungles of Perú. Some teachers tell students to turn on their computers and copy what is written on the black/whiteboards—using computers as expensive notebooks, according to Lily Miranda, who runs a computer lab at a state school in San Borja in a middle-class area of Lima. In the provinces of Perú, computer abuse, addiction and intellectual property theft is more common, faster, and without limits as most professors do not care or engage in plagiarism themselves.22. 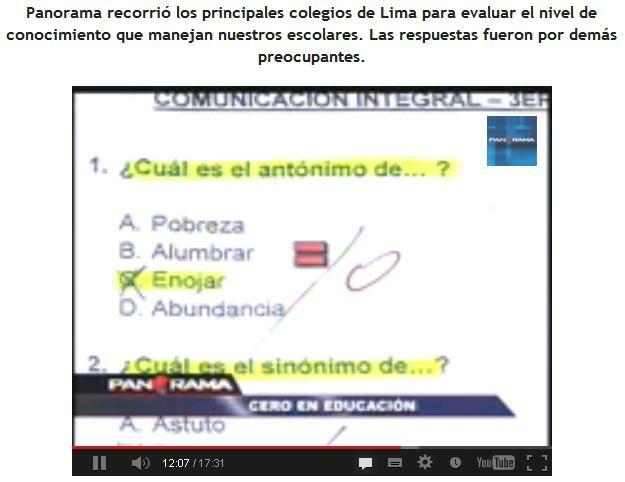 Perú Congress mandated all teachers be tested for competency. 151 passed. The other problem, as several authors and authorities noted, in 2007, of more than 180,000 Peruvian teachers tested for competency, 62% did not reach reading comprehension levels compatible with elementary school PISA level 3. Ninety-two percent (92%) did not reach an acceptable performance level in math.23 The final statistics show that out of the 180,000 teachers in Perú who took the test mandated, only 151 passed. Simply put: the teachers in Perú are increasingly more ignorant and universities that put out new teachers taught by the teachers who have no competence in subject matter become the new illiterate furthering the ignorance of Perú students.24. Gross Domestic Product (GDP) has been consistently rising, but education has been left behind, with fewer PEN (soles nuevos) set aside for better textbooks, better trained teachers, better classrooms, and aid to students that would change the face of Perú from a nation of impoverished, undereducated, and depressed people into a thriving and vibrant community of producers, consumers, and contented citizenry. Too many schools need refurbishing, refinishing, refining, and are in desperate need of libraries. The rural areas, the mountain people and those who live in the jungles deserve an equal opportunity with those in urban areas. If this does not change immediately, Perú has no hope, no future, and no education; it will take strong leadership to force through new curriculum, new courses, new directions and rid schools of inferior to totally-inadequate teachers at all levels—but then the question is, where from will the new teachers come? The only logical solution is to pay teachers more and require additional hours—not like most educational institutes that use teachers on a part time basis so that the institutions do not have to pay higher wages or offer benefits. It is past time that Perú schools, institutes and university become true learning centers that realize that the institution realizes what it wants by paying a real wage and are able to attract strong, highly knowledgeable subject matter experts, build respectable libraries, and higher and rank teachers not only for possessing a degree but by evaluating the degree based on from what university it was taken, what was the overall and also the specific specialty grade average, what has the teacher published, and what is the potential of the teacher to investigate, research and publish. No real teacher thinks that his or her education stops when he or she has completed a degree; the diploma represents only what has been done and an indication of what can be done and must be done. Education is a life-long learning process for the teacher and genuine educator.25 Reading is a daily delight, writing mandated not only by the school but from within the educator, and presentation of material is seen as not a methodology, pedagogy, strategy or technique, but as the real use of facts over fantasies, and the unending quest for truth. No rubric, ritual, rite, or pontification has standing in the war against ignorance, for knowledge is forever unfolding and the armaments are not shields or weapons of destruction but the light to burn away the cobwebs of ignorance. When hopes seems like a mirage, a flame flickering in an angry breeze where no one seems to care about anyone else; when there is little else awaiting the sojourner in this life but who is faced only with the continuance of a mundane existence with little merit or hope; when the winds of change seem fluid around everyone but the self, there is little cause for celebration or rejoicing and ethics becomes meaningless. All that seems real is to sustain life without purpose or merit, to eek out an existence that is not worth living, and personal gain acquires prominence and prefect form no matter what toil or task is necessary, no matter how much the self is prostituted for the moment of repose and respite. This leads those who are denied basics in food, drink, education, and hope turn to other avenues to travel to gain what is needed regardless of the cost and all the calls by the religious are hollow against the wind of want. If there is to be any ethics in Perú, the people must have a better education with better trained and the best educated teachers possible (not just foreign imports but home-grown Peruanos trained in the arts and the sciences who feel a strong bond with the land and wish to stay, not to disappear to a foreign land where they are but one of many and cannot make the difference that each Peruano with a solid education can make in Perú), boasting better books and new authors who can enliven children and adults in well-lighted and airy classrooms, having the opportunity of fulfilling a dream in Perú without having to escape the poverty of Perú. It is time to make Perú great once again, far greater than when it was under Inkarey or any other king, but to create a world class culture with academic institutions that herald a new beginning and not dwell upon a sorry sordid past fostered by the greed of the few against the needs of the many. 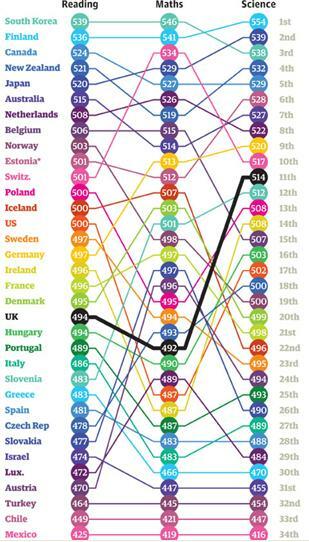 Links to statistics and world ranking in this article have been updated by the accrediting and ranking authorities reflecting the most recent changes. Each ranking site uses its own spelling: The USA uses Brazil, while the correct spelling using Portuguese, the language of the nation in South America correctly spells the country as Brasil. 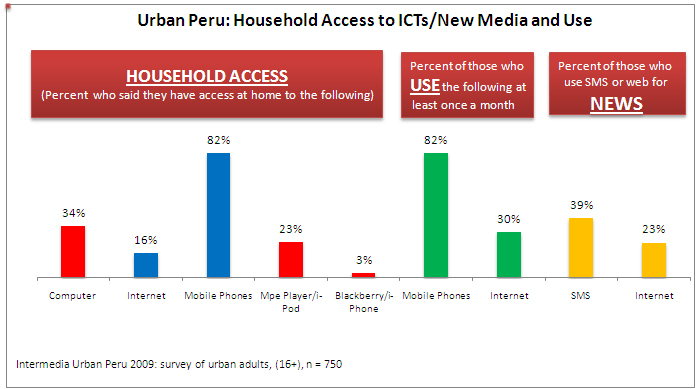 I am planning an updated record to bring Perú, that continues to fall in the area of education shortly. 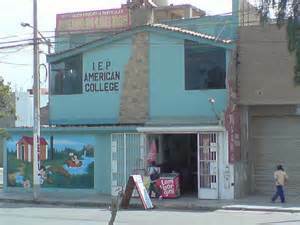 The problem in Perú is the proliferation of private for-profit schools that are used both to make money for their founders as well as generate troops to propagandize for political candidates especially the founders of universities who seek the presidency with no regard for the advance of education or rights of students.